Mysore Masala Dosa is a very popular dosa in the south Indian restaurants. Masala dosa was frequently made by my amma and never knew about the Mysore masala dosa (I rarely go to eat in a restaurant). I first tasted this dosa at my aunt's house and just loved them. From then onwards, I always made this at home. Its been a year and I have made this couple of times and each time, I have revised the recipe by looking into many blogs (for the red chutney). Now the recipe looks perfect. I am sure this dosa will be a hit! Try making it soon. The procedure for making masala dosa is also same, just that red chutney is not applied on the dosa. Soak rice, urad dal, chana dal and methi seeds for 1-2 hours. Grind them together with cooked rice and little water to get a smooth batter. Consistency of the batter should be thick. Let this batter ferment for 8-10 hours. Add salt and adjust the consistency of the batter, if required by adding water (it should be medium thick). Dosa Batter is ready. Heat oil and add mustard seeds. Once it starts spluttering add curry leaves and chopped onions. Fry for a minute and then add chopped green chillies and grated ginger. Fry until the onion becomes translucent and then add turmeric powder. Fry for few seconds and add little water (1-2 cups). Close it with a lid and allow it to cook for few minutes. Once the onion looks cooked, add the cooked potatoes, salt and mix properly. Once the water evaporates completely turn off the heat. Garnish with chopped coriander leaves and add lemon juice. Mix well. Batate baaji is ready. Dry roast dalia for few minutes, until it slightly changes the color. Now grind all the above ingredients to get a fine paste. Add little water while grinding. Red chutney is ready. Once all the above items are ready, then we can start making Mysore masala dosa. Now add little oil/ butter and close the lid for half a minute. Once the dosa looks cooked, then start spreading red chutney on the dosa, like a light coating. By this time the base of the dosa has turned brown. Put 3-4 spoonful of the potato masala on the center of the dosa. Now start folding the dosa on either sides as shown in the picture below. Mysore Masala Dosa is ready!! Update: I also tried making Topi Dosa (Topi means Hat) using the same batter. 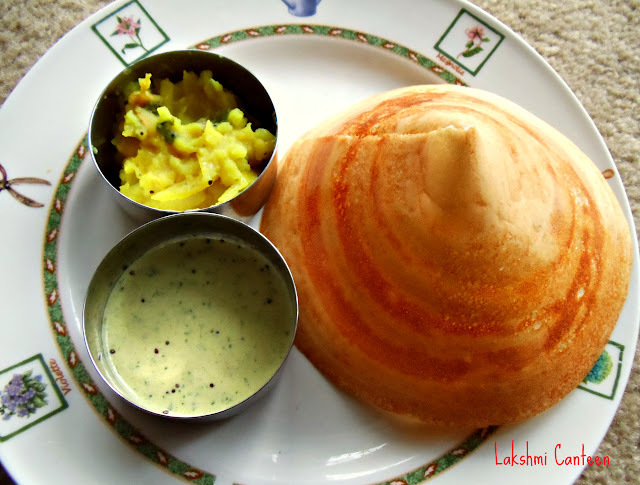 It is also popular as Cone Dosa. Look at its beauty! To make this topi- Once the dosa becomes very crispy, take it out and cut it along its radius with a knife and then make it cone shaped. I love your recipes and your blog..
Hi Manjula, I have a query re the rice that u mention in all ur recipes. Which rice is used??? Is it idly rice or sona masuri ? In this recipe of mysore masala dosa, which rice have u used? Am so confused as we do get just plain white rice (known as dosa rice), also sona masuri which comes under raw rice and then idly rice...which is the ideal one that u prefer using? Thnks in advance. I Gis Ferns, Thanks for writing me. I think sona masuri and dosa rice should work fine. Hope this helps you. Thank you so very much for this recipe. Tried it today & the dosa came out very crisy with the red chutney making it more delicious..!!! !